The renowned hair artist Mo G has styled some of Chicago’s most promising musical artists. Musicians like R&B singer-songwriter Ravyn Lenae and acclaimed singer and poet Jamila Woods have both been graced by her craft. Without question, Mo’s works accentuate the most captivating physical qualities of Black women— rooted in African traditions, she deliberately highlights the beauty of Black ingenuity and pays homage to the glory of the modern Black woman. Mo now styles for some of the biggest names in Chicago, and as a successful entrepreneur she has garnered the attention of thousands through social media with appearances on her Instagram from some of Chicago’s most notable artists, designers, and musicians. Before pursuing hair styling, Mo got her degree in dance, with a minor in psychology, and wanted to be an art teacher. It was when she found herself working at a department store, doing hair on the side, that she realized she wanted to make a change. “I was working at Bloomingdale’s, serving all these rich people and I [thought to myself], I’m never gonna get there, if I keep being on this side, I’ll never get to where they are.” She realized that doing hair was the only thing she continually pursued and enjoyed. “I never thought I could make a living off of it. 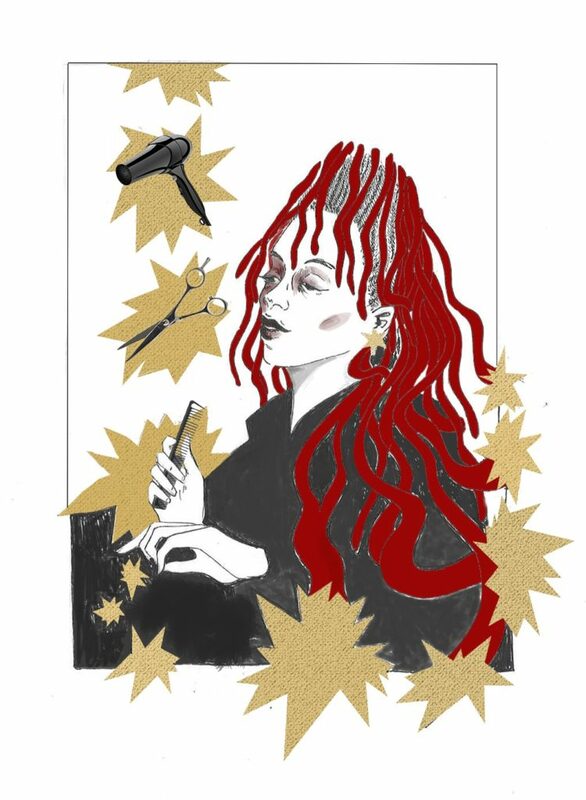 I used to say, I wish I could just like live off of my art, and it wasn’t until other people started telling me that hair is art.” After receiving some compelling encouragement from her coworker, she knew it was time to dedicate herself to her craft. Shortly after, Mo’s friend and the founder of AMFM gallery Ciera Mckissick took notice of the growing collection of leftover braided pieces Mo used to decorate her living room. “I would say I’m like a hair hoarder because I like to keep all my old hairstyles.” Mo was shocked when Ciera asked to show her leftover works in an installation at the Chicago Art Department. “It was just something that I just threw up to be cute, [but] we displayed it, and it was there for like two months. People would constantly take pictures. It was everybody’s favorite at the show.” Today, Mo refers to herself as an artist without hesitation—she has a vision that is shaped by the traditions of the past and her unique perspective of modern beauty. Mo recognizes the historic and symbolic importance of braiding culture dating back to ancient Egypt, where hair was used to indicate social status and to represent individual style. Black hair continues to carry deep personal and symbolic meaning, and Mo and other natural hair stylists work to integrate these long-established symbols into their modern practice. Hair braiding, crocheting, and locking has undeniable significance in the Black community, not only because of its symbolic nature and beauty, but also for its protective quality. With more information about the dangers of toxic hair relaxers or perms— a method that has been used since the early 1900’s to straighten the natural kinks and twists of Black hair —more people have turned to natural hair artists like Mo G. Mo uses braiding and hair extension techniques to achieve styles that are not only beautiful, but are also protective. Social media influencers, white and Black alike, are taking advantage of trending protective hairstyles like box braids, twists, and dreadlocks. Maya Horton is a reporter currently working with The Real Chi. She last interviewed musician Melo Makes Music. She tweets at @Maya_Jamaica.